GALWAY GAA FANS will hope they’re seeing plenty of this impressive vehicle roaring in and out of the country’s top venues this summer. Fast food chain and county team sponsors Supermac’s have splashed their logo all over this stonking lump of metal that will be home to the county’s senior hurlers and footballers on their travels in championship 2015. And if all things go to plan, Sam Maguire or Liam MacCarthy could perch proudly on the dashboard in September if the Tribesmen end their senior All-Ireland famines. We’re not suggesting for a moment that football boss Kevin Walsh and his hurling counterpart Anthony Cunningham will park the bus on the field of play. But for the driver of this multi-seater beauty, that particular role will be an absolute pleasure. We’ve seen plans for Offaly GAA’s Centre of Excellence – and they look fantastic! 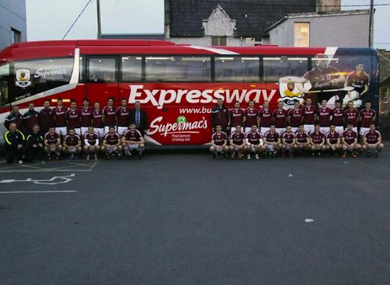 Email “Galway to park the bus - at a GAA ground near you! ”. Feedback on “Galway to park the bus - at a GAA ground near you! ”.